Essential, Well Documented, and Well Written. If you could sum up Surveillance Valley in three words, what would they be? Levine gives us great capsule descriptions of many of the Silicon Valley oligarchs and the writers who celebrate them. However, it was Jacob Applebaum who interested me the most. Such a flamboyant figure who on the one hand was working with Assange and Wikileaks, and on the other was promoting the US government funded TOR Project to the hilt, and getting paid to do so. Truly stranger than fiction. 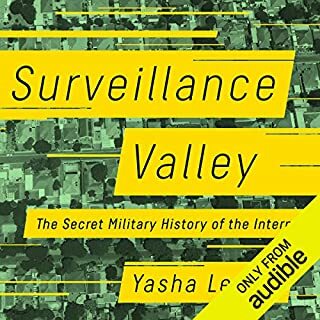 The entire book was fascinating but it is Levine's research into TOR, and its connection to the US military intelligence complex that is most riveting, and also deeply disturbing. Most disturbing is the willingness of so-called internet privacy groups and activists to see Silicon Valley and the US government as somehow at odds on this issue, and to believe that we can somehow code our way around the prying eyes of the CIA and NSA. If you are thinking about getting this book you will not be disappointed. The writing and narration are great, and this is really essential information for anybody who spends time on the internet. What made the experience of listening to Sunburn the most enjoyable? 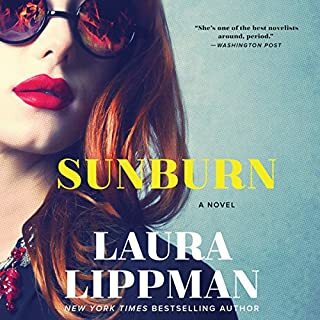 LIppman is a fantastic writer. I have read or listened to all of her books and this is one of her very best. So many great lines. Polly is a terrific character. If you know the work of James M. Cain you'll love the references to his classic works. What was one of the most memorable moments of Sunburn? The book is full of so many surprises that I won't give any away. I'll just say that while the book can be tough and gritty like the best noir, it also has moments of almost unbearable romanticism. Nearly brought me to tears several times. What made the experience of listening to Late Victorian Holocausts the most enjoyable? So nice to listen to an engaged and sophisticated author read by an educated reader with a good voice who doesn't mispronounce names. We get a glimpse of our future on how climate change will devastate the poor and improve the position of the elites, unless there is real resistance. The descriptions of the famines impact in the global south are harrowing. What does James Patrick Cronin bring to the story that you wouldn’t experience if you just read the book? The thing is he was great because he didn't make the audio experience substantially worse then if I read the book. I would love to read all the time but audio books are just more convenient. 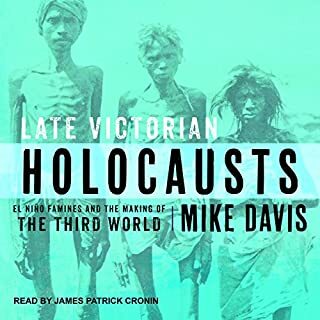 If you could give Late Victorian Holocausts a new subtitle, what would it be? The political economy of famine? No, I like the original subtitle. It's great that Verso is finally putting some of its catalogue on audio. I hope they do this for all Mike Davis books. Then they can start on Perry Anderson. What made the experience of listening to TWA 800 the most enjoyable? The way Cashill packs an incredible amount of information into an enjoyable narrative. Jack Cashill. He takes the listener along on the journey of his investigation of TWA 800 and his mostly unsuccessful attempts to try to bring the story to the elite media. Cashill and I probably don't agree on much politically but he has my highest regard. That he didn't get in the way of Cashill's narrative too much and didn't mispronounce many words. As I think another reviewer said his style is a little too close to that of Robert Stack in his Unsolved Mysteries days. This comes off as a little cheesy but overall it didn't distract me too much. He also mispronounces the last name of Clinton official Jaime Gorelick, whose name comes up a lot. 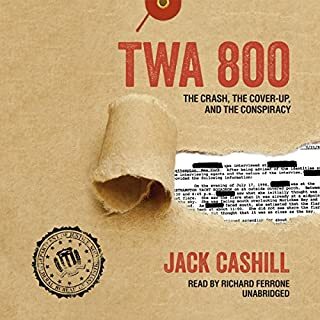 I had recently watched the excellent documentary "TWA Flight 800" and wanted to read a book on the subject. This was perfect. I found the information credible and well presented. I came away convinced. I used to be a huge skeptic about conspiracy theories. Now I don't even like to use that term because it discourages rational thought. If Cashill is right, which I believe he is, we cannot rely on our press, or our government, to give us accurate information about the most significant events of our times. Some of you might think that's obvious but this book really made that sink in for me. I held off getting this one for a while because some of the reviews suggested that Cashill got a little carried away with the anti-Clinton rhetoric. One even charged that this was just another right wing election year polemic, like the kind Roger Stone has been putting out. As a man of the left I assure you it is not. It is possible the publisher thought the book would have added relevance with Hillary running but Cashill has been on this story for decades and is one of the leading independent researchers on the subject. Yes he does mention Benghazi, and compares the cover-up to TWA 800, but it's really for only a few paragraphs. You can easily skip them if you can't stand to read another word about Benghazi. I do think Cashill gives undo weight to the fact that this happened during the Bill Clinton presidency. I think most presidents would have tried to cover up this incident, especially in an election year. 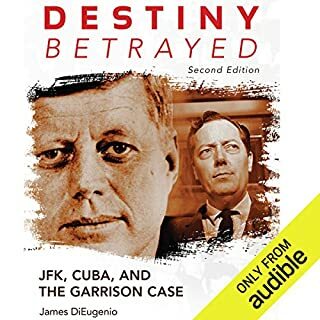 Would you listen to Destiny Betrayed, Second Edition again? Why? Jim Garrison. An American hero. It's amazing how much his investigation uncovered and a tragedy that so many of his files have been destroyed or lost. Let me count the ways. It almost seems like he is deliberately trying to sabotage Jim's terrific book. I don't know what kind of say Jim has in choosing narrators for his audio-books but I'm so glad he got someone else for "Reclaiming Parkland." I wish Jim had read this himself. First there are the mispronunciations. Then there are the impressions and accents. Every time there is a quote this guy does it in a highly distracting vocal impression. And they are just awful. Absolutely painful to listen to. I almost gave up several times because of the narration. This is the worst narrated book I have ever listened to. I have listened to hundreds of audio books and there have been some poor narrators along the way. The main problem usually is mispronunciations of names. But this guy Rohrer takes the cake! Maybe he does a good job with other books but he was a terrible choice for this one. What did you love best about Story of a Death Foretold? The author does not just relate the events around the Presidency and overthrow of Salvador Allende, but engages with fascinating historical and philosophic questions. These include Allende's infamous decision not to provide arms to the workers in the last months of his presidency, and questions about what we mean by democracy and human rights. All the major events are covered here as well. The role of the U.S., Operation Condor, the "economic miracle" under Pinochet, the battle within the Chilean military that preceded the coup, and a detailed overview of Allende's policies. Other reviewers have red baited this book by calling it Marxist. I'm not really sure what the reviewer meant by that. The author is sympathetic to Allende. 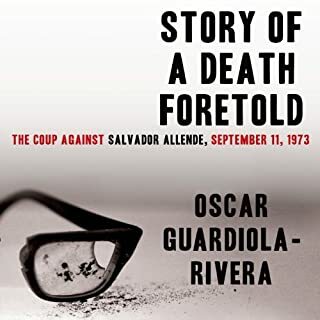 If you believe the coup against Allende was a good thing this is probably not the book for you unless you want to hear what the other side has to say. I'm very glad this fascinating and intelligent book is available on Audible. What other book might you compare Story of a Death Foretold to and why? The author refers to a lot of films in the text. Patricio Guzman's documentary The Battle of Chile would be an excellent companion to this book. This film provides not just the faces and voices of the major characters in the book, but communicates a sense of how important Allende's presidency was, and the fierce obstacles it faced. What aspect of Danny Pardo’s performance would you have changed? For a book with such sophisticated ideas I would have chosen a narrator with a less heavy Latin American accent. It's already been made in a sense. "The Battle of Chile." It's the week before Christmas when a lone robber bursts into a busy Glasgow post office carrying an AK-47. An elderly man suddenly hands his young grandson to a stranger and wordlessly helps the gunman fill bags with cash, then carries them to the door. He opens the door and bows his head; the robber fires off the AK-47, tearing the grandfather in two. DS Alex Morrow arrives on the scene and finds that the alarm system had been disabled before the robbery. Yet upon investigation, none of the employees can be linked to the gunman. 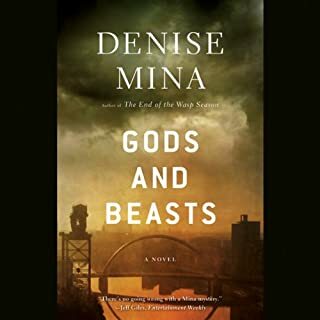 Where does Gods and Beasts rank among all the audiobooks you’ve listened to so far? Mina's Alex Morrow series is one of the best available in the mystery genre. Gods and Beasts may not rank as high as the two earlier entries in the series but it's still a great listen. Did Moira Quirk do a good job differentiating all the characters? How? Quirk is not as good as previous narrators, but for me she did not detract from my enjoyment of the novel.